In this issue of JointHealth™ monthly, we look at the importance of exercise for people living with arthritis. We also discuss types of exercise that are particularly beneficial, and provide some examples of exercises that can be enjoyed outside during the summer months. We hope that you find it helpful. Try to choose a type of exercise, or an exercise program, that you enjoy. It will be much easier to stick to the program if you like what you are doing. Most types of activities are helpful for people living with arthritis, so feel free to do your favourite things such as walking, swimming, golfing, or gardening. Exercise doesn't have to be strenuous or boring to be good for you. Range-of-motion exercises involve taking joints through their full range of movement in order to maintain maximum use. Some examples include stretching and include yoga and Tai Chi. For those with osteoarthritis, it is important to do range-of-motion exercises to maintain joint flexibility. Avoid exercises that overwork the joints, such as climbing. Strengthening exercises will help to reinforce the muscles that support your joints. For those with rheumatoid arthritis, gentle range-of-motion exercises will help to keep the joints mobile. Aquatic exercises will provide a good, low-impact workout that can be carried out even during flare-ups. Walking is a good exercise when symptoms are under control. For people living with all types of arthritis disease, it is important to keep as active as possible to avoid losing mobility. Speak with a doctor about specific exercises for your needs. A little brisk walking (that is, walking at a speed when you feel just a little bit out of breath, but can still carry on a conversation) can go a long way to improving physical health and wellbeing. Walking is inexpensive and easy to do almost anywhere (no gym required). As well, it is probably one of the safest and easiest types of exercise, especially for people who are just starting out on an exercise program. Brisk walking is an aerobic exercise that helps to increase your endurance and strengthens your heart and lungs. It helps to reduce pain by increasing your circulation and by releasing endorphins. Walking is also a weight-bearing exercise, helping to maintain bone density. Find a comfortable pair of walking shoes that provide good support and shock absorbance. Try to walk a minimum of 3 to 5 days each week. Start slow and increase the intensity of your walks as you become more fit. It is important to listen to your body and keep your intensity at a level where you increase your heart rate while getting only slightly out of breath. Gradually build up the duration of your walk. About 30 minutes of walking in a day is ideal. You can start by doing three 10-minute walks and gradually build up to one 30-minute walk or more. Try to find terrain that matches your fitness level. Relatively flat, smooth surfaces may be best for many, especially when starting out. Trails with uneven paths or steep hills may be too intense, and may make it difficult to keep your balance. Uneven terrain can also stress the knees, hips and feet, especially when you are just starting out your exercise regimen. Consider making a plan that contains realistic objectives and short-term goals. Each time you go out for a walk, remember to start slowly, and then do a gentle stretch before walking at a comfortable, but aerobic pace. As you near the end of your walk, slow your pace to cool down and lower your heart rate. When you are done, do another gentle stretch. 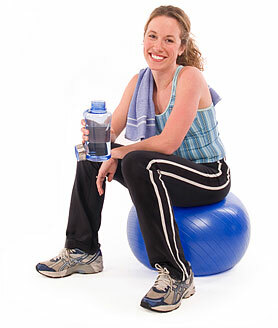 Outdoor exercise often starts to look much more appealing as summer approaches. Now that the snow has melted and the sun is shining, consider taking some of your exercise outside. Go to the beach and spend time with your toes in the sand. Walking in sand can be great exercise. Take a walk in the woods or in a local park alone or with a friend, or join a walking group. Swim in the lake, ocean or an outdoor pool. Remember to wear waterproof sunscreen and re-apply often. Take a bike ride with your friends, family or kids. Flat, smooth surfaces are best when starting out. Play doubles tennis at an outdoor court. Playing tennis with a partner can cut down on the amount of running and side-to-side movements required in a tennis game. Play a few rounds of golf or go lawn bowling. If you are golfing, consider leaving the cart behind and walking from hole to hole. Plant a garden or participate in a community gardening program. There are many good adaptive devices available to make gardening more comfortable. An occupational therapist, or local arthritis group, can be a great resource for finding out more.